A group of volunteers glean apples, pears, apricots, and plums from an orchard. It is almost mid-October in the Missoula Valley, and that means the mornings are getting colder, the days are getting shorter, and Bears and Apples season is coming to a close. The Bears and Apples program at the Great Bear Foundation began in 2001 with the goal of reducing human-bear conflict in the region. As fruit trees ripen in late summer and early fall, bears begin to head down from the mountains in search of easy and accessible food sources. 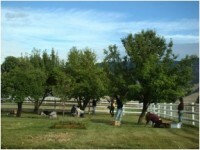 This brings them into the residential areas to reap the benefit of backyard fruit trees. Once bears become accustomed to the high-calorie, low-effort food source they find in backyard fruit trees, it can be hard to break them of that habit. Wildlife managers will remove bears from these residential areas for the safety of the public. However, relocating bears is expensive and, often, the bear will return to the area immediately. This can result in the death of the bear. Volunteers get to keep as much fruit as they want from the gleaning trips. The remainder is donated to the Missoula Food Bank and other community groups. In the Missoula Valley, fruit trees are the number one food attractant for bears. The Bears and Apples program is designed to remove the attractant before bears become accustomed to it. Removing the food source will remove the incentive for the bears to move into residential areas in search of food. The Bears and Apples program had a highly successful 2014 season. 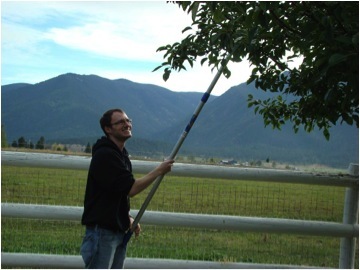 With the help of over 100 interested volunteers, we were able to glean the fruit from over 100 fruit trees (apples, pears, plums, apricots) in the Missoula area. We primarily focused on the Rattlesnake area, but even made some trips out to Lolo and Arlee. From these trees we collected hundreds of pounds of fruit that went to volunteers, nonprofit partners, and the Missoula Food Bank. 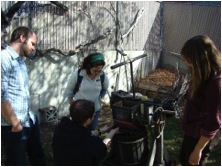 GBF Volunteer Coordinator, Chris Olsen, shows a group of volunteers how to use the cider press. Bears and Apples season culminated in a large service day for the University of Montana Wildlife Society. Over 12 volunteers helped the Great Bear Foundation glean a large orchard out in Arlee that had seen recent black bear activity. The Bears and Apples program would not be possible without the help of our amazing volunteers. We truly appreciate all of their hard work and dedication to helping the bears and the Great Bear Foundation. Bears and Apples is generously funded by Yellowstone to Yukon Conservation Initiative, Patagonia Environmental Grants, and support from members. Click here to become a member and support on-the-ground bear conservation projects like this one. More pictures from our work this fall can be found below. 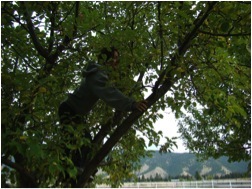 Bears and Apples Coordinator Chris Olsen works on gleaning a pear tree out in Arlee, Montana. 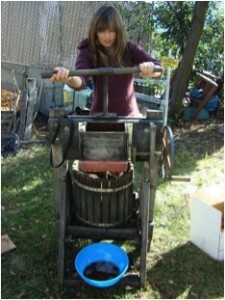 Volunteers utilize Great Bear Foundation’s cider press to make their very own cider. 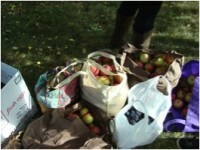 Volunteers have found some of the best cider is made from a mixture of pears and apples. 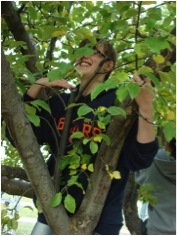 Climbing trees is often one of the highlights for volunteers with Bears and Apples.